Do you follow your intuition? Do you think you don’t have any and are wandering through life with no inner guide? 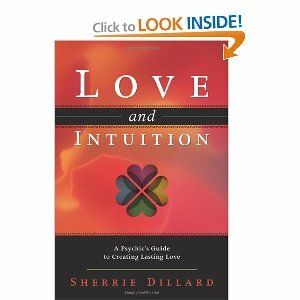 Sherrie Dillard feels that everyone has intuition; you just don’t know how to listen to it. Sherrie has over twenty-five years of experience when it comes to intuition. She is a professional psychic reader. She found herself divorced after many years and figured that as a psychic she should have no trouble with her love life. She was wrong. Since this confused her, she set out to figure out how people can develop their inner intuition and use it to make their love life better. In the book you will find what intuitive type you are. She has a questionnaire that you fill out to find how you pick up information. After you figure that out Sherrie guides you through seven skills you will need to develop your intuition. Throughout the chapters are stories and experiences from Sherrie’s clients. They are meant to help you evaluate your own experiences with the exercises she guides you through. I loved reading about other people’s experiences. It validated some of my own and made it seem not so “out there” in regards to the entire process. The other chapter that I thought was fun was the Fun and Games with Intuitive Romance chapter. There are lots of good tips on connecting with your partner through their intuitive type. It is meant to help you connect on a deeper level than you are working with now. I wasn’t sure what to expect with this book after I got it. I didn’t realize the rest of the title was “A Psychic’s Guide to Creating Lasting Love”. Not that it would have changed my willingness to read it had I known but I was expecting something a little different. I wasn’t disappointed and I probably enjoyed it more than I would have it was more of a psychology type book. There’s a lot of good tips in here for everyone on how to connect better with your inner feelings and I’d definitely recommend it to anyone who wanted to know if they should read it.